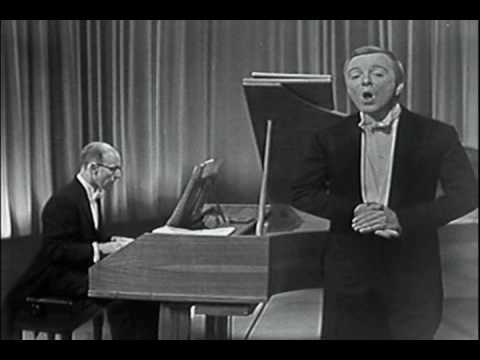 Russell Oberlin made his name in the 1950s when the only countertenor to be heard on the world stage was Alfred Deller. He co-founded New York Pro Musica Antiqua in 1952, standing out as ‘a lone practitioner’ in the USA. Three years later Leonard Bernstein engaged him for a Messiah recording and kept him in mind when composing Chichester Psalms. Glenn Gould (see video) was another admirer. Russell also appeared as Oberon in the London premiere of Britten’s Midsummer Night’s Dream. But in 1964, at the age of 36, he gave up public performance and retired to teach at Hunter College. Russell Oberlin died yesterday in New York at the age of 88. I first heard his voice in a Purcell LP when I was about 14. Now I go to YouTube and “Vivi, tiranno” frequently and with pleasure. Russell, whom I got to know via mutual friends, turned out to be a great gentleman: amusing, charming, self-affacing. Yes, he was a lovely man with an absolutely extraordinarly beautiful voice. I was almost asleep in a Tokyo hotel 15 years ago having forgotten to switch off the TV when I first heard this recording and instantly awoke. I have loved the cantata ever since. I had no idea Oberlin retired from performing at such an early stage, Nor that he himself stated he was not a countertenor – merely a tenor with a very high range which meant he did not need to sing the repertoire using falsetto. Rats. Wonderful, clean, very crisp voice — and a chest voice at that. We’re so used to hearing “countertenor” and thinking “falsettist” that we forget some men — more than we think — are capable of singing full-on alto in a chest voice. For most of the 20th century, such men have lived in pop and rock, but they do exist, and it’s a shame that Oberlin was really the only example of such a voice being used for classical music and opera. I truly hope some narrowly built, small young guy takes up that baton now that Oberlin has been laid to rest. I had the great fortune to work with Russell in the early 90s. He was the most thoughtful charming gentleman. We had lot of fun and laughs. He had the that rich, yet pure tone vey few counter tenors can offer. We had been out of touch for a long time. Now, I never will hear his voice. He has been my measuring bar for singing early music, and counter-tenor voice. I regret so much not having seen Mr. Oberlin since the 10/31/09 Harold Brown Centenary at Advent (Bway/93rd). Tried to meet several times but as he was often in Europe it never happened. A favorite teacher of my friends who were in his Hunter Collegium, and of all who love beautiful singing. Recommend you read the wonderful Pro Musica stories in James Gollins Noah Greenberg biography. I did have the pleasure of interviewing Russell Oberlin (on the phone from Toronto to New York) in the early ’90,s as part of my research on Glenn Gould’s musical partners. Oberlin recorded Bach’s Cantata no 54 with Gould conducting from the keyboard (a strange modified piano sounding more like an out of tune honky tonk). I recall Oberlin saying that the whole adventure was one of his most cherished musical experiences and that working with Gould was truly memorable.